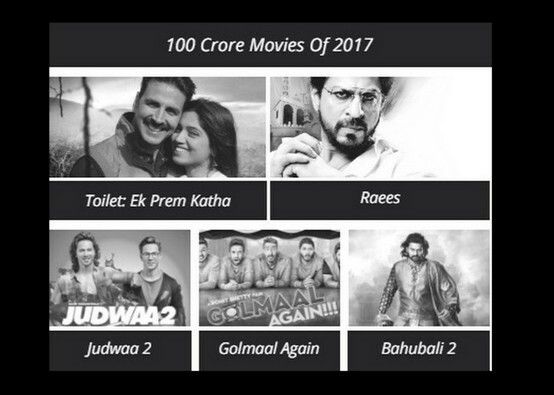 Bollywood’s 100 Crores grossers of 2017: From Golmaal Again to Raees, a look at the movies that have entered the elite 100 crore club in 2017. Released on 28 April 2017, Baahubali 2 set the box office on fire from the word go. The Hindi version of the movie earned 41 crores on the opening day, 128 crores in the opening weekend and mammoth 247 crores in the first week. The movie managed to earn 511 crores in its lifetime. A huge blockbuster. 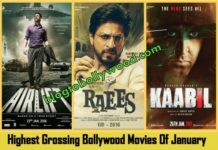 Released on 25 Jan 2017 along with Hrithik Roshan’s Kaabil, Raees opened to good response and earned 122.36 crores in the first week (9 days). However, the movie slowed down after that and managed to earn 137.51 crores in its lifetime. Rakesh Roshan’s decision to release Kaabil in front of Raees backfired. The movie managed to earn 104 crores in its lifetime. In case of solo release, Kaabil would have earned around 135 to 140 crores. Akshay Kumar’s first release of the year, Jolly LLB 2 was a sequel to 2013 sleeper hit Jolly LLB. Jolly LLB 2 was loved by the audience and earned 117 crores at the domestic box office. Salman Khan’s Eid release Tubelight failed to win hearts. Audience rejected the movie from the first day itself and eventually it ended it box office run at 121.25 crores. A rare flop for Salman Khan. Akshay Kumar’s idea of Shouchalya worked wonders. The movie received good response across all sections of the society and emerged as Akshay Kumar’s highest grossing movie. It earned 133.6 crores at the domestic box office. The remake of 1997 comic classic Judwaa set the cash registers ringing. Released on 29 Sep, the movie earned 138 crores and become Varun Dhawan’s second 100 crore grosser of the year. The deadly combo of Varun Dhawan and Ajay Devgn proved their mettle again. Released on Diwali, Golmaal Again had a terrific box office run. It has so far eared 195 crores and is all set to enter the elite 200 crore club. With Padmavati and Tiger Zinda Hai releasing in December, the total count will reach 11. This will be the highest number for Bollywood. In 2012 and 2014, nine movies entered elite 100 crore club of Bollywood.